So excited, but what next? Thread: So excited, but what next? I've posted before that my mother is a talented seamstress, but not a quilter. It was only after I started quilting that she mentioned, quite casually one day, a quilt they had at home when she was growing up in the 1930s. She didn't know anything about it but felt pretty sure it was made either by her own mother as a 'bottom drawer' piece, or by her maternal grandmother as a wedding gift. We spoke about it at the time, but it seemed there was not much to say about it once we worked out it was a traditional log cabin with red centers, double sized, and in daily use. My mother hasn't seen it for more than sixty years- the old family home is long gone, so there seemed to be no point wondering what happened to it. My grandmother died very young and so many of her stories died with her. So, this morning, my mother and I are having a chat about everything and nothing, and I tell her what I am working on, and how my middle daughter has me making a madly scrappy and rule breaking log cabin for her bed. And..... You know what's coming, right? She says really casually that last time she was talking with her sister they were talking about the old quilt and her older sister confirmed that their mother made it, and said... Drumroll.... SHE HAS IT!!!! So, apart from wanting to jump in my car right now and drive over to my aunt's, my head is buzzing. I never saw it in her house because it is apparently falling apart, but she kept it. Happy dance! So, when I get to visit it, what is it important for me to ask? Obviously I'll be asking what stories she was told about it, if she recalls any of the fabrics being in clothing, or any stories of where the fabric came from. I'll be looking really closely at the construction, taking photos of everything- front, back, innards, quilting pattern used..... What else? How does one behave when one meets an old family quilt for the first time?!!!! I am so excited!!! I think I would put the histrory down on paper to keep with this quilt. We never know where these quilts will end up. 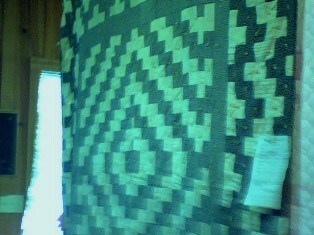 I've bought many used quilts at garage sales and estate sales that have many stories .... all untold ..... so sad. make a label for it. even if you end up with it. History is everything. ​I can understand your excitement on having a tangible link to your own family's quilting history. Super excited for you and take lots of pictures! Labels are important. My mother and Aunts put them on all theirs. I need to sew a label on the quilt my grandmother made for my high school graduation. There are only a few of her grandchildren that has one she made. I need to do that! Share a picture if you can! HOW EXCITING!!! I can so feel your excitement and am so happy for you. I would definitely get as much history as possible written up and at least put with it. I think I would be afraid to put a label on it myself, but love the idea of the history staying with the quilt. I think you have a good idea of questions to ask. My question is, would she be willing to part with it so it doesn't end up in a yard sale or with someone who doesn't appreciate it? Or maybe she would pass it down to you when her time comes? Take a look at it's condition and see if there is anything that can be done to preserve it from further deterioration. And see how it is being stored...maybe take some acid-free paper with you and gently fold or roll it another direction when you have to put it away. Its obvious you have a real love and appreciation for quilts, so I hope you end up with it. So many people, think well its old so I'll hang on to it, and stuff it in a closet or basement or the attic where it will deteriorate even further. Quilts, especially the old ones need lots of TLC. Please let us know what happens to the quilt, and would love to see pictures! I know that it would be awkward to ask about this quilt's future but I do feel it is important question and one that hopefully your aunt will appreciate. Just simply ask her if you may make a label or a written history to go with the quilt. And while discussing this, mention that you would hate to see it leave the family. See her reaction and maybe go from there. Simply tell her that you would like to add a note to go with the quilt so that when she passes, her children remember to contact you if they don't want the quilt. I am only beginning to enjoy and appreciate quilting but I have always appreciated family heirlooms and am honored when one of my children, cousins, or my nephew as that I insure something is kept in the family. It tells me that they also appreciate their heritage. Hopefully, your aunt and her daughter will feel the same way. Tell her you would "cherish" this quilt if it were to ever come into your possession one day. She'll be able to see it on your face anyway, I'm sure. I wish you a blessed day when you meet this treasure. I finished a quilt that my MIL started. It was one of 8 quilts she made for each of her 8 kids. I typed the story and printed it on Printed Treasures and then sewed it to the back of the quilt. I felt that if I just wrote down the story that eventually they story and the quilt would be seperated. By sewing the story to the back, it will always be together. If you can, why not take an old tape recorder or if you have the new phones or camera that take movies, (if you can get them off the phone somehow, I can't) take the movie so you have your aunt and the quilt together. Then you can type up the info. Good luck. Ditto to MaryMo's comment. Everything "anyone" know about the quilt should be labeled. I would display it proudly with every wear and tear spot, centrally located. it's about character and history and that is the beauty of it. I totally understand your excitement! Best regards on seeing the quilt. It is an exiting story, and the story itself is an heirloom. Good luck on your journey. If we don't have memories we have nothing. Happy for you to be able to see the quilt and get some stories. I love the story. I will be praying that it ends up with the owner that will really appreciate it. Six years ago, my hubby called from Florida when they were cleaning out my MIL's garage and told me they found an old quilt in the cedar chest. He wanted to know if I wanted it. He said it was made by his Great Grandmother Higby in 1912. My first statement to him was, "It's not in the car yet?" He told me, "No, Natalie (our 4 year old granddaughter) is playing on it on the concrete driveway". I gasped and asked him to take a blanket out for Natalie to play on and rescue that treasure. I am now the owner of this treasure. It is made from what looks like old shirt fabric. Although it resembles the trip around the world, it is made with rectangles and not squares and I love the border. I really hope they see your excitement over the family treasure and give it to you. If you end up with the quilt, please promise you will share a picture of it. bring tears to my eyes just thinking about your special story!!!!! Yeah, we all understand. Hope you get it and can preserve it somehow. I've seen some that were so tattered that there was only enough to frame and add a providence...(sp?) in the corner. Label it with what you learn. Such a nice story...good luck with it...looking forward to seeing the pictures. I have a story about an old family quilt..not quite so nice. A woman my MIL grew up with ran into her at McDonalds one day after many many years. They change contact information then soon afterwards the woman comes to MIL's house and says, I bought a quilt off of your mother years and years ago (MIL's mother was dirt poor and most likely sold it to feed her family) So she GAVE my MIL the quilt...it was then shelved. While visiting my in laws my FIL (an angry drunk) caused a scene about something unimportant to this story and ended up offending my husband and I quite badly. In apology we were gifted this quilt....a beautiful quilt made with 1920's and 1930's fabrics. Excellent condition..no rips...no wear spots...no stains........it has since that day has been named....The Guilt Quilt....but whatever the case....sure am glad we were the ones to get it! !